This article first appeared in The Edge Financial Daily, on January 15, 2018. KUALA LUMPUR: The Mofaz group of companies has set out towards what would be its maiden listing in at least three years’ time via its property and construction business after acquiring a majority stake in a Chinese family-owned contractor. It is eyeing a possible initial public offering (IPO) that hinges on the financial performance of its new construction unit. On Saturday, the family-owned bumiputera conglomerate, via Kumpulan Mofaz Sdn Bhd, had inked an agreement for a 70% stake in YCM Construction Sdn Bhd. However, the purchase price was not disclosed. Upon the deal’s completion, the latter would be renamed Mofaz YCM Sdn Bhd. Mofaz founder and president Mohamed Fauzy Abdul Hamid said the new construction unit would take up the conglomerate’s construction and property development projects with an overall gross development value (GDV) of RM2 billion. “In the next three years, we would have completed about RM300 million to RM400 million worth of jobs, and I’m sure the profit element is between 10% and 15%,” Mohamed Fauzy told The Edge Financial Daily after the signing ceremony. He said the project pipeline represents about half of Mofaz’s existing land bank and it (Mofaz) is examining the remaining parcels for future development. According to the Securities Commission’s listing requirements, the profit test listing route requires a company to have between three years and five years of uninterrupted profitability, with an aggregate net profit totalling RM20 million — with RM6 million from the most recent financial year. Incorporated in 1986, YCM Construction was founded by businessman Yap Chee Meng, who is currently the managing director. His brother Yap Chee Seng is a director of the company. A Companies Commission of Malaysia search showed that YCM has RM11 million in current and non-current assets in its balance sheet against liabilities of RM9.48 million. The company recorded a net profit of RM176,335 on revenue of RM33.82 million for the financial year ended Dec 31, 2015. Mohamed Fauzy said the acquisition seeks to tap YCM’s experience and expertise in the construction sector, particularly in cost management and supply chain efficiency. YCM holds a G7-category contractor’s licence and is also ISO9001:2008-certified. It also has a warehousing and steel fabrication facility measuring 25,000 sq ft in Serendah, Selangor. 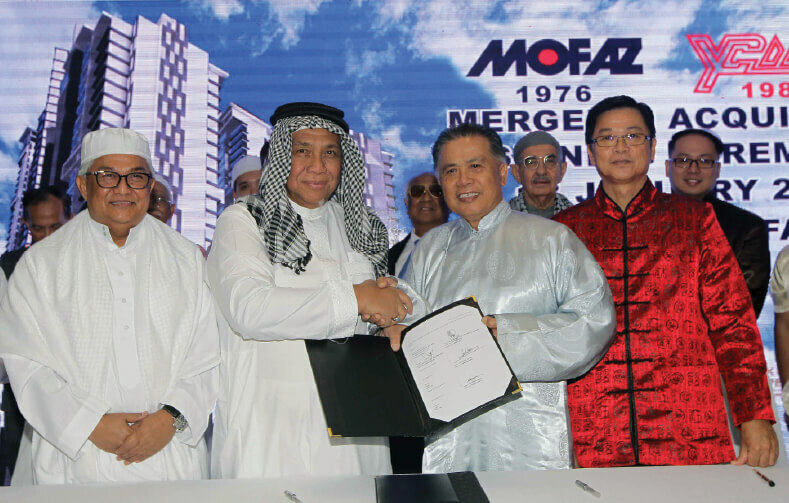 Given Mofaz’s own history spanning 42 years across automotive, trading, hospitality, construction and manufacturing businesses, among others, the new entity would boast a combined 74 years’ worth of business experience, said Mohamed Fauzy. Mofaz’s main businesses include being a distributor of Honda and Mercedes-Benz vehicles. It also operates several resorts and manufactures some fast-moving consumer goods, such as the Alla Fonte drinking water. The biggest among the projects is an upcoming high-rise development in Sungai Penchala here, located near the Empire City Damansara project, which is envisioned to offer 1,400 units with a GDV of RM1.2 billion. Mohamed Fauzy expects final approvals to be obtained within the next month. While the property market remains soft now, the Mofaz founder is confident that the market would be returning to the upcycle in a few years and hopes to catch the wave. The listing target marks a shift for low-key businessman Mohamed Fauzy, a well-connected corporate man who was once among the poster boys of the National Economic Policy but had not taken his businesses to the stock market. Among his claim to fame is leading the consortium that started AirAsia in the early 1990s, although the airline saw subsequently troubled years that culminated in its famous takeover and revival by Tan Sri Tony Fernandes and his partners. Mofaz remained a shareholder until AirAsia subsequently listed on Bursa Malaysia in November 2004. Mohamed Fauzy said the acquisition and listing path seek to set the stage for the next generation of both his and the Yap family. “When our children take over, we want to make sure they are given a platform and a foundation which is strong and with good strategy [in place],” he remarked, adding that upon listing, “they can bring in more professionals and more consultants to grow faster”.